In this integration guide we will take you through the most important steps of instrumenting your game with the GameAnalytics Unity SDK. From v3.11.0 and onwards you need to manually initialize the SDK by calling GameAnalytics.Initialize() from your own GameObject (with script execution order coming after GameAnalytics script’s order if your object is in the same scene as the GameAnalytics object as some code is called on Awake event which needs to be called before initializing the sdk). Read more about it in the Initialization section here. The Unity SDK supports Windows, Mac, Linux, WebGL, iOS, tvOS, UWP, Tizen, Universal Windows 8 and Android. In the Unity editor go to Assets > Import Package > Custom Package. Browse to the package location on your hard disk. Leave all the files checked and click Import. Check that the Unity environment has been already configured with the modules for the platforms you are targeting. If you are targeting iOS, this is a good time to go to File > Build Settings > iOS and make sure the iOS module is loaded and you can create iOS builds. Unzip the GameAnalytics files and copy them all into the Assets folder in your Unity project. Look in the Window menu in the Editor and there will be a GameAnalytics entry. Through the toolbar menu select Window/GameAnalytics/Select Settings. A Settings gameobject will automatically be created if not located. If you have not already, you can register for a GameAnalytics accounts via our online form here or via the Settings menu in the Unity editor. Click the Login button in Settings and enter your credentials. After login, you can select an existing studio/game by selecting your platform and then Add Platform. When selected the game key and the secret key will be automatically fetched and configured. You need to manually initialize the SDK by calling GameAnalytics.Initialize() from your own GameObject (with script execution order coming after GameAnalytics script’s order if your object is in the same scene as the GameAnalytics object as some code is called on Awake event which needs to be called before initializing the sdk). What is the GameAnalytics GameObject? To use GameAnalytics you need to add the GameAnalytics GameObject to your starting scene. It is required and used to handle initialization when the game is launched. A GameAnalytics object will be placed in the scene you are currently on (remember to save the scene to keep the changes). Make sure only one GameAnalytics object exists in your entire game. It will not be destroyed upon scene changes. Unity provides the GameObject methods called awake and start. First all GameObjects get the awake call. When every awake is done then all GameObjects get the start call. The execution order for each is not fixed. The GameAnalytics settings GameObject is initialized in the awake method, but other GameObjects could have had their awake call happen before this. 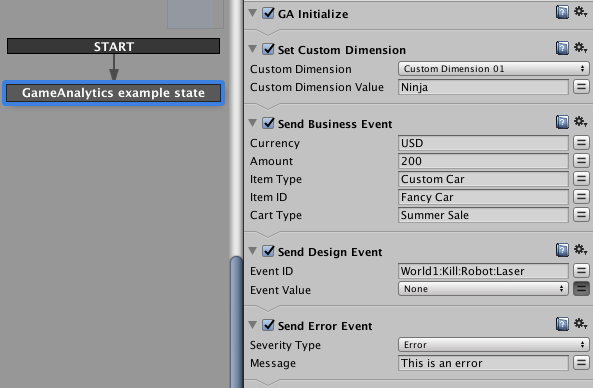 Therefore when submitting events from GameObjects in Unity it is recommended to do this after (or inside) the start method. This will ensure everything is ready. If an event is submitted before initialization then the log will output something like this. No events are actually being generated in the Editor. You need to build and run the game for the platform of your interest. Read more about Unity execution order here. Receipt validation in Unity is supported for the following stores. receipt base64 string The App Store receipt. Null allowed.Read about App Store receipt here. receipt string INAPP_PURCHASE_DATA. Null allowed. Read about Android receipt here. signature base64 string INAPP_DATA_SIGNATURE. Null allowed. Read about Android signature here. The receipt assigned to the Android business event method should not be base64 encoded. The GameAnalytics Android library will encode the receipt for you. 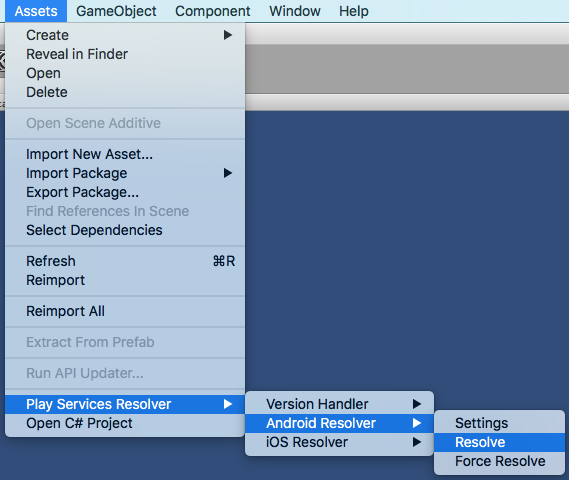 The IStoreController object that you used to initialize the Unity IAP service contains all the products available for purchase declared by you as well as the receipts. On iOS you need to send the entire payload while for Android GameAnalytics should receive only the contents of the json field inside the payload. Information about these can be found in the Unity documentation about the receipts. For parsing the receipt JSON and getting the data listed under the json field we recommend a JSON parser such as JSON Object. We do not support purchase validation for any of the other platforms listed by Unity IAP (Mac App store or Windows store). flowType enum yes Add (source) or subtract (sink) resource. One of the available currencies set in GA_Settings (Setup tab).This string can only contain [A-Za-z] characters. amount float yes Amount sourced or sunk. One of the available item types set in GA_Settings (Setup tab). Be careful to not call the resource event too often! In a game where the user collect coins fairly fast you should not call a Source event on each pickup. Instead you should count the coins and send a single Source event when the user either completes or fails the level. progressionStatus enum yes Status of added progression (start, complete, fail). score int no The player’s score. severity enum yes Severity of error (critical, debug, error, info, warning). message string yes Error message (Optional, can be null). eventName string yes The event string can have 1 to 5 parts. The parts are separated by ‘:’ with a max length of 64 each. e.g. “world1:kill:robot:laser”. The parts can be written only with a-zA-Z0-9 characters. eventValue float no Number value of event. To use GameAnalytics you need a game key and a game secret for each platform you are using (iOS / Android). The build is used to specify the current version of your game. Specify it using a string. The build version should be used for changing production builds of the game. We recommend creating a separate game when implementing or testing the SDK. During gameplay, it is possible to set values for 3 different custom dimensions. For each custom dimension, it is needed specify a whitelist. You cannot set a custom dimension value unless it is specified here first. For more information about custom dimensions go here. When submitting resource events you specify a resource currency and resource item type. It is needed to specify a whitelist for each of these. You cannot submit a resource event using other values than specified here. It is imperative to avoid including non-alpha-numerical characters in the company name in PlayerSettings. This name is included when creating temporary local files and as a result a character like ; would break the path to these files. Sometimes it is useful to supply this user_id manually – for example, if you download raw data for processing and need to match your internal user id (could be a database index on your user table) to the data collected through GameAnalytics. Read more about sessions here. Enable this to catch error and exception messages within Unity when the game is running and submit them to GameAnalytics. This is useful for discovering unforeseen issues after the game has been launched. It will submit an error event using the type error, warning or critical. Enable this to calculate and submit average FPS automatically. The frame rendering will be monitored during an interval of 20 seconds. Then a design event called GA:AverageFPS is submitted with the average FPS as a value. The average FPS is useful for general performance overview, but it will not detect critical FPS drops. These drops are often more noticeable by players versus a low (but steady) average FPS. Enable the critical fps detection to submit an event when sudden drops in FPS are detected. This is done by calculating average FPS over the last second. If this should drop below 10 it will register this occurrence internally. After 20 seconds it will select the lowest critical FPS registered (if any) and submit a design event called GA:CriticalFPS with the critical average FPS. The SDK consists of Unity code (C# wrapper) that call code inside some native libraries (iOS / Android). When playing in the editor the native code is not compiled/used. To get the detailed console output generated from the native code it is needed to compile/launch the game in native. When playing in the editor you will get output whenever an event is added from Unity code. It will not submit (from native code) as this part of the SDK is not compiled when playing in the editor. The events are not validated yet and you will therefore not get any errors related to validation or authentication. Use editor debugging when implementing events into your game to verify events are called at the correct place/time and with the intended data. You need to tell the GameAnalytics SDK that you are targeting mobile platforms when using the package for Unity 4.6.x. Go to Window → GameAnalytics → Exclude GA Mono DLLs. When switching to targeting other platforms than mobile simply select the Include GA Mono DLLs option. A Unity build-script (GameAnalytics → Editor → GA_PostprocessBuild.cs) will configure the generated Xcode project automatically during the build phase. This is only supported in Unity 5 (supporting the post-build) and Xcode7+ (using the .tbd libraries). The XCode API is only directly included in Unity 5 but the XCode API is actually packaged with Unity 4.6 you just need to copy UnityEditor.iOS.Extensions.Xcode.dll into the plugins folder. Under Mac OS X is found at /Applications/Unity/Unity.app/Contents/PlaybackEngines/iossupport and under Windows, it is found at C:Program FilesUnityEditorDataPlaybackEnginesiossupport (both assuming you installed Unity at the default location). If you are not using Unity 5 (or the process above) then you need to configure build settings manually. 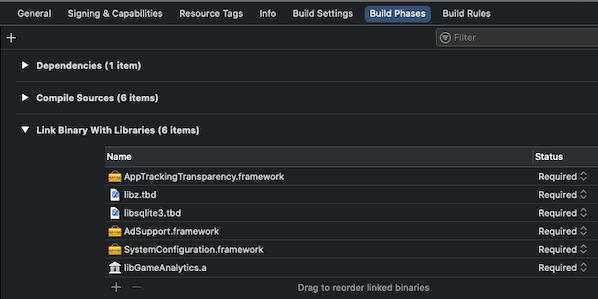 In Xcode go to the configuration section called Build Phases and locate the Link Binary With Libraries. Add the following for Xcode7 (using .tbd libraries). A Unity game will automatically include additional libraries that are not listed above. Are you deploying testflight builds? Please note that every launch of a testflight game will generate a new user. This is due to how testflight is simulating certain device identifiers. A testflight game will register the same user as a “New User” each time the game is launched. Once it is deployed to the app store (or run locally on an actual device) it will track user metrics correctly. If you are using other plugins which have their own AndroidManifest.xml file then you may get build errors. READ_EXTERNAL_STORAGE and WRITE_EXTERNAL_STORAGE permissions are optional. The SDK will use context.getExternalCacheDir() (if it exists) to store its internal database, as the database can reach up to 10MB if the user keeps being offline for longer periods of time while playing to still be able to send the events when the user is back online. If you are using other plugins which include their own Google Play Services library then you may get build errors. A popular example of this is if you’re including the Chartboost SDK. In this case, it should work to delete the “google-play-services_lib” folder which was added when importing the Charboost SDK package. This approach should work with any plugin that includes the Google Play Services library. Remember to add InternetClient capability under Player Settings in Unity. Read an overview of custom dimensions here. To add custom dimensions to your events you will first have to create a list of all the allowed values. You can do this in Settings under the Setup tab. Any value which is not defined will be ignored. To set a custom dimension call one of the functions below. customDimension string yes One of the available dimension values set in Settings (Setup tab). Will persist cross session. Set to null to remove again. facebookId string yes Facebook id of the player. gender string yes Gender of the player. birthYear int yes Birth year of the player. GameAnalytics is set up to work with PlayMaker to make it as easy as possible for you to send events using the visual PlayMaker scripting tools. You need to tell our SDK that it will be used with PlayMaker. To do so you need to toggle the SDK scripts by clicking Window>GameAnalytics>PlayMaker>Toggle Scripts. Make sure at this stage PlayMaker is already added to Unity. At this stage a new category for Actions named GameAnalytics should pop-up in the PlayMaker Actions list used for when adding an action to a state. When using GameAnalytics actions you may notice that some of the parameters are mandatory while others can be set to none. Follow closely our documentation about each event type (Business, Design, Progression, Resource and Error) before using the actions. In order to better understand how to use GameAnalytics please read our guidelines about the implementation process and how the tool reads custom events. On Android a new session will start once the game is launched or when the app is resuming if there is no current session. A session will end once the game is going to home-screen (or is not visible anymore). It will end the session at once if the application received the onStop event from the game activity. It can also end the session if onPause event was received and 90 seconds have passed (sometimes only the onPause will trigger even though the user left the app). The automatic session handling only works if the game is contained in one activity. It will then handle session end and start based on the events on that single activity. This behavior is common (having one activity) but some games define multiple activities and this automatic session handling will not work in an optimal way. With manual session handling it is recommended to also call endSession when the game activity event onStop is fired. This will ensure a correct session close when users click the home or on/off button. Next event submits will fix potential missing session_end from earlier sessions. //Example of hierarchy with 2 levels. The event string can have 1 to 5 parts. The parts are separated by ‘:’ with a max length of 64 each. //The amount of possible unique events are count(part1)*count(part2)*...*count(part5). //An instrumentation should not generate more than 50000 UNIQUE events! //in order to view accurate monetization metrics in the default dashboards. //The business event will be marked as invalid unless real or sandbox transactions occur for iOS or Android. //This information can be collected but can only be examined by looking into the raw events data. //Custom IDs should be used only if there is a need to do so. By default, GameAnalytics assigns and manages IDs to each unique user. //If 'Use custom ID' is enable in Settings then GameAnalytics will not start tracking any form of events until 'SetCustomId' is called.